Since they called the fourth flick in the Friday the 13th series The Final Chapter, Friday the 13th Part V: A New Beginning shouldn’t exist. But I guess they decided money remained to be made, so the series continues with this 1985 flick. In a departure from the first three sequels, Beginning doesn’t open with a rehash of the prior flicks. It quickly reintroduces the character of Tommy Jarvis (Corey Feldman), the kid who finished off Jason in Final Chapter. He watches some goons dig up Jason’s grave, an action that revives the killer and sends the madman after the boy. However, Tommy soon wakes up from this vision to reveal that he’s now a young adult (John Shepherd) in the care of a mental hospital. Yes, it appears that little Tommy went a bit bonkers after his encounter with Jason, so now the extremely withdrawn dude remains a charge of the public mental health system. They send him to the rustic Pinehurst Youth Development Center, where he quickly meets assistant director Pam Roberts (Melanie Kinnaman) and director Matthew Letter (Richard Young). They brief him on the center’s system and what they hope to do for him. From there Tommy settles in and we meet the other residents as they go about their chores. One of them turns out to be a little nuttier than the rest; Vic Faden (Mark Venturini) goes psycho when he angrily takes an axe to fat, dopey resident Joey (Dominick Brascia). The cops cart off Vic, but we soon see that another murderer stalks the area when a mystery man violently slays a pair of young toughs. No one will accuse New Beginning of deviating radically from the template established in the first four movies, but I’ll give it some credit for its attempts to broaden matters. Much of the set-up and execution remains the same. The plot offers another batch of youngsters isolated in the middle of the woods, and we see a series of gruesome killings. Overall, I prefer New Beginning among the first five Friday movies. Will it stay my favorite after I watch the next three? That I don’t know, and to call it the best of the bunch seems like faint praise anyway, as none of the prior four did a lot for me. Beginning doesn’t reinvent the wheel, but it shows some creativity and turns into a reasonably satisfying slasher flick. Friday the 13th Part V: A New Beginning appears in an aspect ratio of approximately 1.85:1 on this single-sided, double-layered DVD; the image has been enhanced for 16X9 televisions. A few minor concerns popped up here, but Beginning offered probably the strongest visuals of the first five Friday movies. From start to finish, sharpness looked strong. Only a smidgen of softness crept into a few shots, as the movie lacked many instances of ill-defined images. The film remained nicely delineated and concise most of the time. I noticed no signs of jagged edges or shimmering, and edge enhancement stayed minimal. Print flaws also decreased when compared to prior flicks. I still saw sporadic examples of specks, spots and grain, but these didn’t cause too many distractions. After the drab-looking Final Chapter, the colors of Beginning rebounded well. The movie depicted a natural palette with good clarity and vivacity. Even colored lighting was smooth and distinctive, as the movie consistently presented lively tones. Blacks also improved and came across as deep and firm, while shadows were nicely concise and not too opaque. The movie looked very good and seemed very satisfying. Friday the 13th: The New Beginning stood as the final flick in the series to come with a monaural soundtrack. While slightly superior to the others, it still remained average for its era. Speech betrayed no edginess and sounded reasonably natural, with tones that were a little tinny but not badly so. Effects stayed clear and acceptably accurate but lacked much range or heft. Music was a little broader than usual. The score offered decent dynamics but remained moderately thin overall. Another mediocre track, the audio of Beginning was fine but not any better than that. 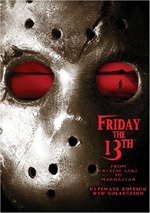 This version of Friday the 13th Part V comes as part of a package entitled From Crystal Lake to Manhattan - Ultimate Edition DVD Collection. It gathers the first eight Friday flicks onto four discs and adds a fifth platter of supplements. Four of the flicks include commentaries that I’ll discuss when I get to those movies. Since Paramount designed the set as a connected package, I didn’t give the individual discs grades for supplements; I’ll reserve those for an overall review of the fifth DVD. Anyone who wants a radical departure from the standard Friday the 13th epic won’t get it in The New Beginning. However, the movie manages to broaden its horizons somewhat, as we finally get a Friday that feels like more than just a remake of the others. The DVD offers very good picture with acceptable audio. New Beginning won’t win new fans but it should entertain those with a taste for this sort of flick.